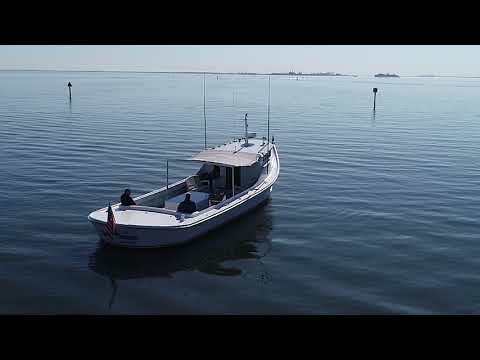 #ChesapeakeDeadrise “Grey Goose” is a Traditional Round Stern Chesapeake Bay Deadrise, with this modern twist, she has a fiberglass exterior. Originally built by the Rollins Brothers in Poquoson, VA as the “Bertha Lea”, she was also knows as the famous “Tikila Sunrise” a landmark along the Lynnhaven River. As the “Grey Goose” she has taken part in many Charitable Cruises in the Tidewater VA and Hampton Roads area, with style and grace. Powered by a single 3208T Caterpillar, she is perfectly happy at 10-12 kts and will top out at 17 kts, modern Navigational Equipment (GPS/Plotter, Radar, VHF, XMSat Weather) as well as a wonderful XMSat Stereo/Entertainment system.